We are closed today due to our need to go outside and push white fluffy stuff around! 1. Perform grout cleanup per grout manufacturer's instructions. 2. Mix 3 to 5 oz (90 to 147 mL) of Grout Haze Clean-Up per gallon (3.8 L) of water. 3. Wet a grout sponge or terry cloth towel with the cleaning solution, wring out excess liquid. 4. Wipe diagonally across the tile. 5. Repeat steps 3 and 4 every 10 to 15 ft (.9 M to 1.3 M) or as necessary. 6. Remove residual cleaning solution using a clean grout sponge or terry cloth towel dampened with clean water only. AFTER GROUT CLEANUP WITHIN 10 DAYS OF GROUTING: Use full strength if grout haze was not completely removed during grout cleanup. Apply directly to surface and agitate with white nylon scrub pad or brush. Allow product to dwell for 5 to 10 minutes for stubborn areas or heavier grout residue. Rinse with clean water to remove residual cleaning solution. USE THAT SPOON FOR CARPET STAINS! 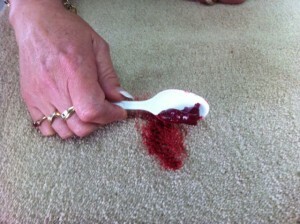 Did you know that a spoon is the tool of choice to start removing a carpet stain? Regular carpet care is important if you want to enjoy your carpet for many years to come. Regular vacuum cleaning is recommended at least twice per week during normal wear; this helps ensure rich, radiant colours and prevents loose dirt becoming embedded. If possible, use a brush vacuum cleaner or one with a brush attachment because, with these, even embedded dirt can be removed without trouble. However, if staining should occur please follow the four-step system below. STEP 1 Remove loose dirt with a vacuum cleaner. Dried-in substances should first be carefully removed with a spoon or the back of a knife, then simply brushed or vacuumed out. If liquid, blot up as much as possible with absorbent white cloth or paper immediately. STEP 2 Treat the stain with lukewarm water. Blot up the liquid with absorbent white cloth of paper. Do not use washing-up liquid or washing powder as areas treated with these substances tend to attract dirt more quickly. STEP 3 For stains that cannot be removed with water, it is advisable to use a commercial carpet shampoo. STEP 4 If you are unable to remove the stain completely after following the first three steps, you should try the use of a stain remover. Make sure that the carpet is dry before this treatment, using only commercial stain removers with organic solvents. To avoid any subsequent discolouration, pre-test the stain remover at an inconspicuous place first. Please always follow the directions for use and dab the remover on with a clean cloth – never apply it direct. If the stain still has not disappeared at the end of this four-step procedure, please contact our Helpline without delay. Here is a selection of the most common stains that can be removed from your carpet with suitable cleaning agents. Ask at your retailer about a suitable cleaning agent for carpets. Although it can seem like just another morning of purging the Accutinter machine for our Benjamin Moore Paints, I do love the color pattern. What do you see? GUILFORD GREEN. OUR COLOR OF THE YEAR. "A neutral that's natural. A silvery green that works with, well, everything. No worries. No second thoughts. Just a brush, dipped in a can, whooshed on a wall, and a whole lot of happily ever after." We offer 3,500 colors. Pick one. Go monochromatic. It’s what feels right, right now. Try warm, cool, dark and light layers of the same hue. It’s one chromatic concept, gracefully flowing from room to room. The program offers families a three-month stay in a fully furnished home. The family is responsible to pay a monthly program fee that helps to offset the cost of maintaining the homes. Once in the home, residents are connected to local Community Care Teams who offer mentoring and hands on assistance and local community services, such as the Food Band and Furniture Bank. Families are provided with information about other community services such as Tabor Community Services, Bridge of Hope and United Way Agency Programs. - Praying for the ministry. - Volunteering to serve as a mentor or to do minor maintenance to the homes or to serve in other capacities, such as promotion, screening clients, etc. - Donating non-perishable food to the Mount Joy Food Bank.